President Mohammed Mursi has ordered Egyptian parliament to reconvene, a month after it was dissolved. The Supreme Court had ruled parliament unconstitutional as party members contested seats reserved for independents. The military, then running the country, enforced the move. But Mohammed Mursi, whose Muslim Brotherhood won most seats, said the chamber should reconvene until a new election is held. His decision will be seen as a direct challenge to the army, analysts say. Mohammed Mursi was installed as the country’s first freely elected president last month. The military had taken over the reins of power after the revolution that ended strongman Hosni Mubarak’s 30-year rule last year. The army move was initially welcomed by many of the protesters, but became increasingly unpopular as critics accused its leaders of wanting to hold on to power. Army chiefs formally handed power to Mohammed Mursi on 30 June, but before his election they granted themselves sweeping powers. A constitutional declaration stripped the president of any authority over the military, gave military chiefs legislative powers, and ordered that the military would install a panel to frame new constitution. 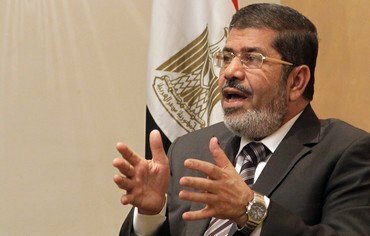 However, in his presidential decree, Mohammed Mursi said the recalled parliament would frame a new constitution. A new election would be held 60 days after the constitution had been agreed by referendum, the decree said. On a speech on the day of his inauguration, Mohammed Mursi said parliament had been elected in a free and fair vote. “The army is now returning to its original role, protecting the nation and its borders,” he said.